First official announcement clip of the highly anticipated sequel introduces Benedict Cumberbatch's villain. The crew of the Starship Enterprise from JJ Abram's reboot of "Star Trek"
The crew of the Enterprise is about to face a lot of doom and gloom on their latest mission. The first official teaser for J.J. Abrams' "Star Trek Into Darkness" is out and gives Trekkies their first good glimpse of the villain played by Benedict Cumberbatch, who's plotting some sort of revenge against Kirk, Spock and the rest of the starship gang. Here's a look at five key moments we gleaned from the trailer. 1. Boldly Going Dark: "You think your world is safe. It is an illusion. A comforting lie told to protect you. Enjoy these final moments of peace. For I have returned to have my vengeance." Those words spoken by a brooding voice, presumably Cumberbatch's fiendish character, kick off this action-packed minute-long clip and are accompanied by images of our heroes apparently back on Earth. But the mood is dark and foreboding and a Sept. 11 vibe hangs in the air, as do fighter jets that zoom over a terrified city. 2. We Have Met the Enemy and He Is...: After a series of quick shots including Chris Pine's Kirk running through an alien-looking field of red plants, at last we are introduced to the Enterprise's new foe, who appears with a pretty big gun. Initially Cumberbatch was rumored to be playing a new take on Khan Noonien Singh, the superhuman tyrant from the original TV series that terrorized Kirk and crew in "Star Trek II: The Wrath of Khan." But word lately is that he's actually Lt. Cmdr. Gary Mitchell, a former friend of Kirk's dating back to his cadet days who also appeared on the original "Star Trek" TV series and acquired telekinetic powers after crossing a galactic barrier. 3. The Gang's All Here: After Cumberbatch is done talking, an "Inception"-esque score kicks into gear and we see that all the regulars from 2009's "Star Trek" reboot are back. Among the most prominent to flash by in the trailer are John Cho's Sulu and Zachary Quinto's Spock, the latter shown brandishing his own gun and running through a city. No doubt they have their work cut out for them on this adventure, which also features some pretty high-octane CGI thrills including a fiery volcano-like landscape, a guy in a space suit flying down from the heavens, and an explosion aboard the deck of a starship. 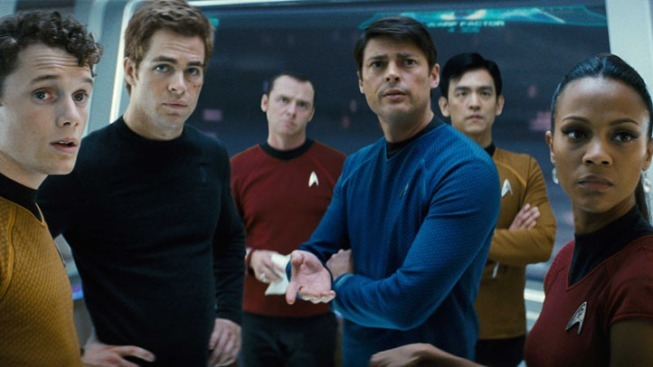 "Star Trek" sequel's Enterprise is filled with "snakes!" 4. She's Beaming! Another moment features Zoe Saldana, reprising her role as Uhura and looking sexier than ever, as she and Kirk confront the enemy that awaits them. No word if she and Spock will continue their flirtation in this go-round. 5. Where Art Thou, Final Frontier? Oddly enough, there's little in the way of space involved in this teaser, nor warp speed travel, as the Enterprise appears very much grounded--or in this case surfacing from a vast ocean. For fanboys who can't stand the wait, Paramount is beaming the first nine minutes of "Star Trek Into Darkness" into IMAX 3-D theaters ahead of "The Hobbit: An Unexpected Journey" on Dec. 14. The sequel is set to hit theaters in both 3-D and 2-D on May 17, 2013.